For 30 years, Pulse Mining Systems has delivered Enterprise Resource Planning (ERP) tools tailored to the mining industry. Based in the Newcastle / Hunter Region, the company provides services to support mining and the largest, coal-exporting port in the world. With a strong understanding of the processes and challenges inherent in mining, the company created a point of difference by offering products tailored to meet these unique requirements. After three decades in business, Pulse Mining realized it should take another look at its technology offering. Mark Spry was brought onboard as the new CEO; he set out to identify new revenue opportunities. This was hard, especially given that we are in the midst of a global mining industry downturn, particularly in relation to coal and iron ore, the two most significant resources, exported by Australia. Mining organizations have responded by cutting overheads, the obvious costs containment measures have been implemented and miners are now searching for ways to utilize the vast amount of (already) captured transactional data to drive greater insights and operational efficiencies. Spry quickly identified the need for simple, cost-effective and tactical business intelligence (BI) solution to help customers obtain these insights, and the Visualisation and Analytics (V&A) Division was born. Our objective was to create a solution that saved our customers time, was cost-effective, and delivered value from the word go. To be competitive we needed to deliver agile reporting, quick-fire creation of visualisations and analytics capabilities. The technology also had to be simple to use and empower employees to obtain insights from the data they had collected. Recently, Pulse Mining was able to cross-reference coal quality data with GPS coordinates to identify the best quality coal. Pulse Mining selected 12-year BI veteran, Rob Parvin, to head up its new analytics and reporting team. Rob’s challenge was to develop a BI strategy and supporting technology that could deliver analytics to new and existing customers. The new solution had to be compatible with Pulse Mining’s existing technology yet able to deliver the agility and functionality customers expect in a leading BI offering. “Many of Pulse Mining’s customers store data in Excel spreadsheets and had developed their own means of extracting essential information, but they were arduous and time consuming,” said Rob Parvin, founding V&A Manager, Pulse Mining. For example, one of Pulse Mining’s customers had an employee whose job was solely focused on managing production data and determining the value and quantity of coal being produced on a daily basis. Pulse Mining needed to present something compelling to demonstrate why customers should change the way they’ve worked for many years. Several clients showed interest in obtaining an analytics solution that could give them insights that had previously eluded them. Pulse Mining set out to develop the right offering. Parvin evaluated a number of analytics solutions to identify the best BI technologies to integrate into Pulse Mining’s offering. He was impressed with Tableau’s ease of use and agility. Parvin also recognised that Pulse Mining could add value to their analytics by offering consulting services to help customers make the most of their data. Parvin’s team required no training to use Tableau; their expertise combined with Tableau’s usability meant they could launch straight into developing their analytics solution. Pulse Mining’s new tactical BI offering is built on technology from Tableau and Tableau partner, Birst. The team created a set of ‘plug-and-play’ analytics products made for the mining industry that could deliver data visualisations from different areas of the business into a central hub. Due to its compatibility with a variety of back-end data systems and unstructured data sources, Tableau is a strong component of the Pulse Mining BI offering. Pulse Mining has a breadth of customer data sources and Tableau is versatile enough to be utilised across all its customers. Pulse Mining used Tableau on top of a data source created from a combination of custom Excel macros and connectors into established operational systems. From this they could then present solid examples of what the technology was capable of. With this solution, we have found a way to make our customers’ data work for them in ways it never has before – and they can do it quickly and cost-effectively. Not only was Pulse Mining able to deliver insights to its customers, but it was able to do so fast. During an introductory presentation to Whitehaven Coal, Pulse Mining was able to answer a question about an operational anomaly on the spot; this question had been asked for over 20 years! Pulse Mining delivered this offering to Whitehaven Coal in a very short timeframe. From the proof of concept, it was less than six months until the technology was being incrementally rolled out across the organisation. Many of Pulse Mining System’s clients have experienced massive savings in terms of sorting and analyzing data. For example, at one client site one employee has the sole focus of managing production data and determining the value and quantity of coal being produced on a daily basis. Blending data via Tableau has allowed employees to cross-reference data sets. In a particular instance, an employee blended finance and production data into a single report which made the answer much clearer. “Today, instead of spending days administering data, the employee can focus on analysing the reports and identifying different behaviours and incidents and how they impact the bottom line,” said Parvin. Pulse Mining initially sold four licenses to Whitehaven Coal and this has now increased to 20 across the company. “Tableau is helping our customers make sense of their otherwise disparate and siloed data,” said Parvin. “Take one example where staff at a mine were capturing data from water samples in individual, mismatched spreadsheets, without using common terminology. We worked with that customer to identify corresponding data points and by plugging that information into Tableau, the customer could deliver working, practical and informative analytics and reports,” said Parvin. 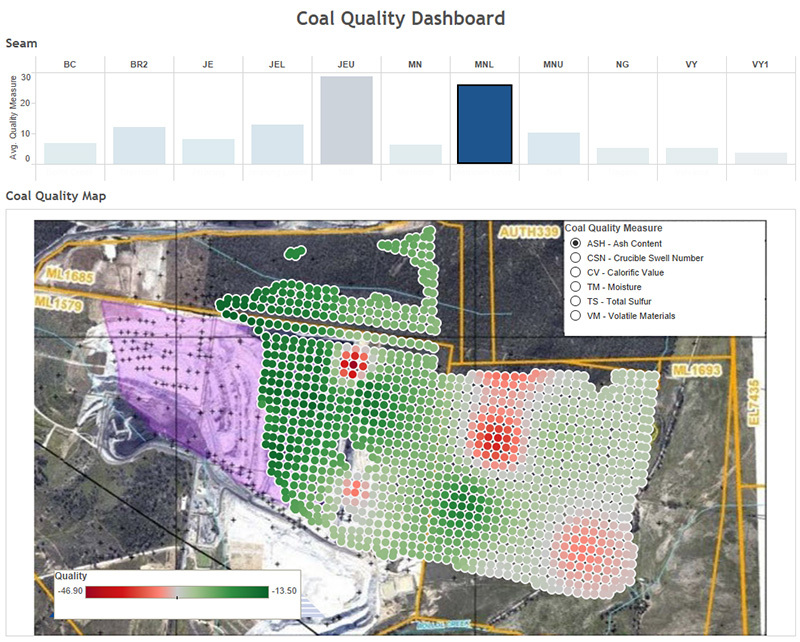 Pulse Mining’s BI solution set is today allowing its customers to create visualisations on coal quality, the impacts of the coal extraction and transport process, machinery maintenance, and much more. Recently, they were even able to cross-reference coal quality data with GPS coordinates to showcase where in the mine the best quality coal is. The technology has seen an exciting uptake among new and existing mining customers and has delivered the new revenue stream that Pulse Mining was searching for. Since it has been built as an analytics fabric on top of Pulse Mining’s ERP solution, this has ensured that the existing technology remains relevant and productive. “With this solution, we have found a way to make our customers’ data work for them in ways it never has before – and they can do it quickly and cost-effectively,” said Parvin.